TVLogic is a leader in the designing, manufacturing and developing high-performance HD / 4K video equipment for the digital broadcast and professional video markets. TVLogic's founder has had a long history in broadcast research and developing in KBS (Korean Broadcasting System). With extensive experiences in high-end broadcast, HD video, harnessed with a real passion for practicality, TVLogic was set up to provide high performance products for market. 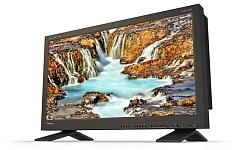 VLogic (www.tvlogicusa.com) was at NAB with a range of native UHD/4K model displays, additional display sizes that extend its high-end LCD series, and a 55-inch precision OLED monitor.